Happy Friday! It's finally here! I don't know about you guys but I am so relieved. I had moments this week where I was worried my friend Friday would never get here! I'm Tara from Curl E. Cue's and I am so super excited about today's project! 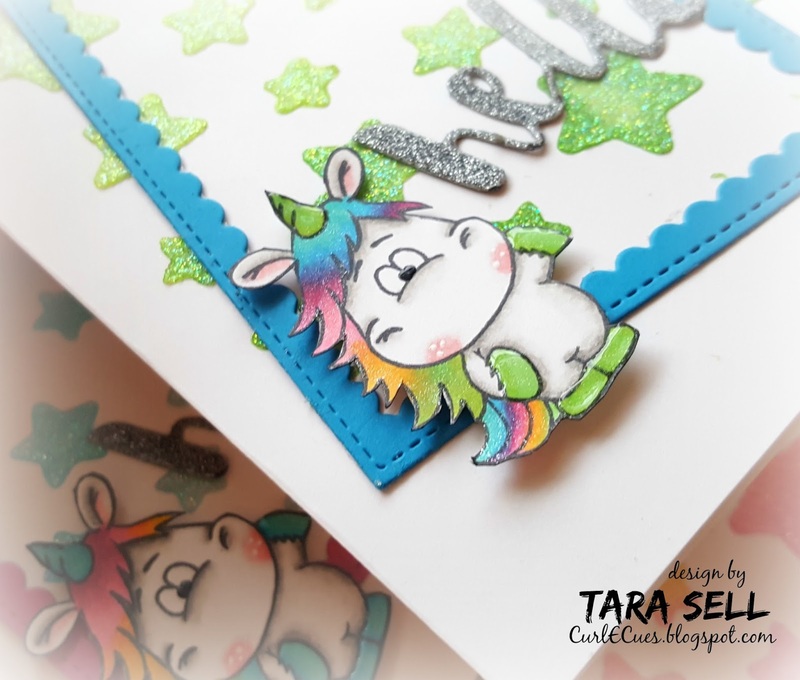 This new Unicorns stamp set is just dreamy! And as soon as I saw it I just knew that my glitter paste was coming out to play. Because nothing screams UNICORN like some sparkle, right?! I started by mixing some Sugar Glitter Paste with different colors of Distress Inks and applying it over a stencil directly onto my card bases. I love that you can get any color you can imagine by using this technique! 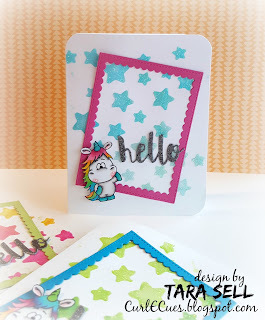 Then I colored in the super stinking cute waving unicorn from the stamp set. The really fun part was using a rainbow of markers to blend his mane! This was the first time I had tried blending Copics that were not in the same color family and I had so much fun! Check out the video below to catch all the tips I picked up while I colored. 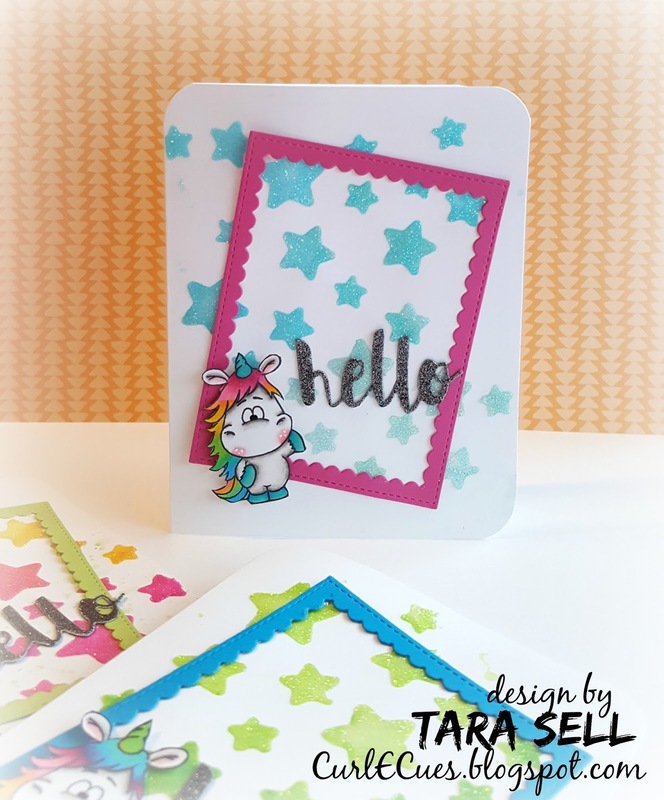 Some fun and bright frames, a little glossy accents and three rounded corners (my kiddo's idea - she claims it is the next big trend in card making) and these puppies are done! I had so much fun with this adorable Unicorns stamp set! Thank you all so much for stopping by and I'll catch you next time! Have a great weekend! Bye! Love your video and your cards!!! I can't wait to get that set!! It is too adorable!!!! It looks like I will have to make a new order : how could I resist to get the Unicorn stamps set when I see such incredibles cards ! I love them, they are so cute. Thank you, Isabelle! 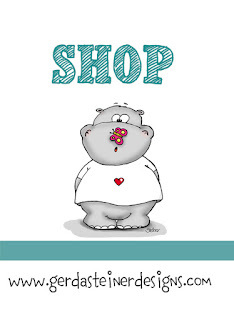 You're so right, such adorable stamps!!! Surprise birthday party with the Unicorns! I'm a lucky duck to have you!